Bruttium. Caulonia. c. 525-500 BC. Stater, 8.16gg. (12h). 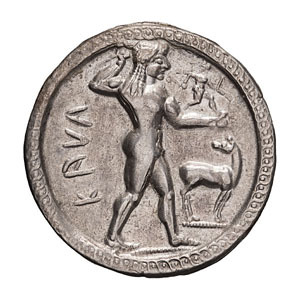 Obv: ΚΑVΛ Apollo striding right, holding lustral branch behind head in right hand, and with running daemon (also holding branches) on outstretched left arm. In right field, stag standing right, looking back. Guilloche border. Rx: Obverse type incuse, to left, without inscription; rim border. HN Italy 2035. SNG ANS 142 (same dies). Beautifully centered on a broad flan. 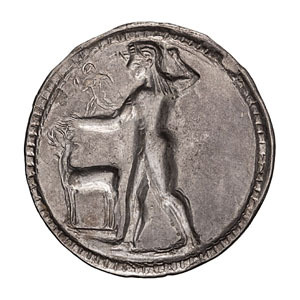 This is an exceptional example of this highly desirable issue showing a beautiful example of archaic Greek sculpture. Mint State. NGC 4625018-017. Ex Berk 153, 13 March 2007, lot 85.